What do dwarf elephants have to do with climate change? Charles Lyell Award Lecture by Dr Tori Herridge, 2012 British Science Festival. It was also rather cool that this year marked the 150th anniversary of the first scientific description of a dwarf elephant — at an earlier British Science Festival, no less [read more about that here]. 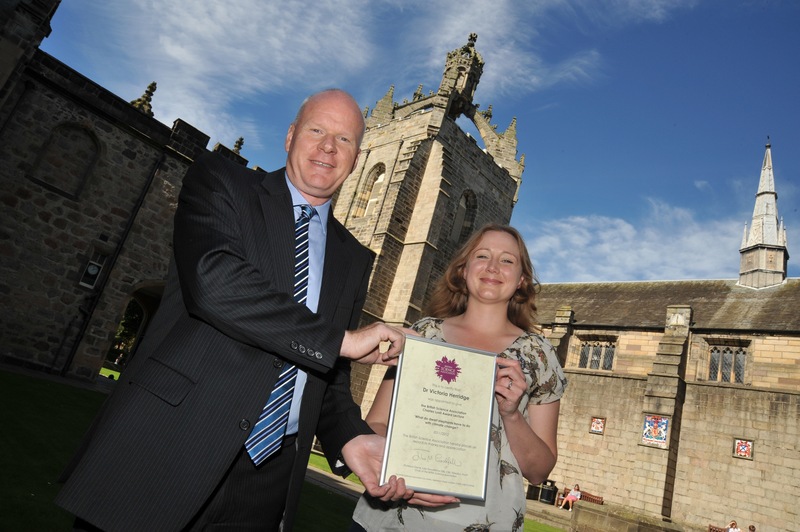 Receiving my award certificate on a gorgeous day, at the very beautiful Univeristy of Aberdeen! Photo (c) British Science Association. The talk had to be at least 25% interactive, and suitable for families. So I had a fun time inventing demos to explain sea level change in the ice age and concepts like Island Biogeography in a child-friendly way. It was a little perplexing when the audience filed in and there were absolutely no children at all, but I think everyone had a good time. After all, who doesn’t love a demo which involves a tyvek CSI suit and a bottle of spray cream…?